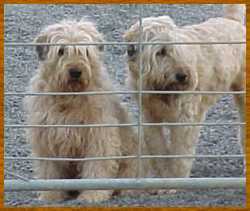 Search and adopt a Wheaten Terrier near you. The origins of the Soft Coated Wheaten Terrier are a bit misty, but the breed is thought to date back over 200 years. With the historical Irish emphasis on oral traditions over written ones, it is not too surprising that the history of terriers belonging to farmers and the poorer folk is not well documented. References place long-legged terriers with open coats and wheaten color in the areas around Cork and Wicklow (southern Ireland) as well as around Ballymena (northern Ireland). These were general purpose farmers' dogs -- a hard life requiring solid, intelligent dogs with enough size to enforce authority, but not so large that upkeep was expensive. The Wheaten is a happy, steady dog and shows himself gaily with an air of self-confidence. He is alert and exhibits interest in his surroundings.